As per the information provided by the Bureau of Labor Statistics, the state of Delaware offered annual and hourly mean income of $27,630 and $13.28, in May 2013. DE employed 5,250 nursing assistants in various hospitals and healthcare institutions. In May 2013, employment per 1000 jobs was 12.73. 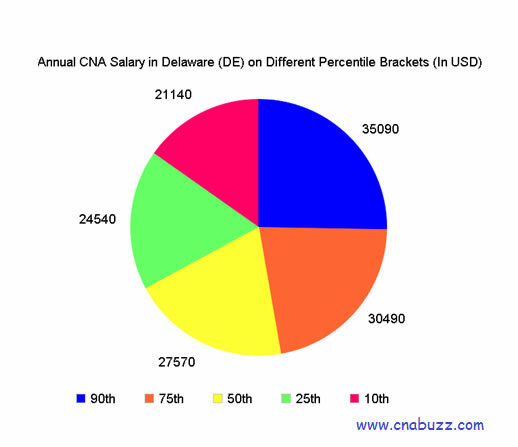 Average CNA salary in Delaware in December 2014 (according to the statistics of indeed.com) was $21,000, which was reported to be 12% lower as compared to the national average CNA income. The table shown below gives percentile wages estimated for CNAs. The income of certified nursing assistants varies at different percentile levels. 90% of CNAs made less than $35,090; 10% made more than $35,090. 75% received less than $30,490; 25% received more than $30,490. 50% of the employees received an amount less than $27,570; the rest of 50% received more than $27,570. 25% of CNAs provided annual wages less than $24,540; 75% were provided more than $24,540. 10% of employees were offered less than $21,140; 90% were offered more than $21,140. The cost of living and demand of CNAs greatly affect the salary of nurse aides in different cities of Florida. A number of factors are considered, while choosing the income; geographical location is one of them. The highest median annual pay ($33,286) was provided by Bear, Delaware City, Middletown, New Castle, Newark and Wilmington, with median hourly salary of $16. The lowest median annual pay ($31,862) was provided by Dover, with median hourly salary of $15. The median monthly earnings in the state ranged between $2,655 and $2,774. The median weekly salary fluctuated from $613 to $640. There are a number of job titles in the state of Delaware. Every position in this profession has its respective responsibilities and duties. In the table below, you can evaluate the earning figures of the different job titles. With the salary of $28,000, CNA Hospices were the highest paid professionals. CNA Rrmc received $26,000 and Medical Assistant Family Practice received $25,000. The lowest paid professionals were Correctional Prison Facility CNA, with the annual salary of $13,000. The earnings of people with other designations varied from $13,000 to $28,000. Nursing career is one such profession that almost all aspirants look forward to. Healthcare facilities and hospitals offer proper program, lucrative perks, and flexible work schedules in order to accomplish the demand of nurses. As per the projections of the BLS, 1,534,400 nurse assistant were employed in the U.S. in 2012, which is likely to increase to 1,855,600 by 2022. Thus, the overall outlook seems to be outstanding, and undoubtedly, one can enjoy a great future in this field of nursing in Delaware. Question 1 – Please help me in suggesting some of the best paid nursing assistant jobs in Delaware? Answer – As per the reports of indeed.com, CNA Hospice is the highest paying job title in DE with an annual income $28000 (as of December 2014). Other top paid job titles include CNA Rrmc, CNA Medical Surgical, CNA Neurology Riverbend, CNA Float Pool Riverbend, and Medical Assistant Family Practice. Question 2 – Presently, I am working as a nursing assistant in Colorado, but planning to move to Delaware. How much salary can I expect in the state? Answer – If you are planning to start your nursing practice in the state of DE, you can expect an average annual pay of $21000 (according to the data provided by the indeed.com in December 2014).